There’s something comforting about a homemade pie. No matter what the season, you’ll find a delightful treat to make from the pages of The Four & Twenty Blackbirds Pie Book: Uncommon Recipes From the Celebrated Brooklyn Pie Shop. Beets are naturally rich in color and have an earthy, sweet flavor when roasted that pairs nicely with apples and lends the perfect blushing color to the fruit. For a cheat on the beets, you can purchase a pack of precooked vacuum-sealed beets; use some for your pie and save the rest for a salad. Stir the flour, salt and sugar together in a large bowl. Add the butter pieces and lard and coat with the flour mixture using a bench scraper or spatula. With a pastry blender, cut the butter into the flour mixture, working quickly until mostly pea-size pieces of butter remain (a few larger pieces are OK; be careful not to overblend). Combine the water, cider vinegar and ice in a large measuring cup or bowl. Sprinkle 2 tablespoons of the ice water mixture over the flour mixture, and mix and cut it in with a bench scraper or spatula until it is fully incorporated. Add more of the ice water mixture, 1 or 2 tablespoons at a time, and mix until the dough comes together in a ball, with some dry bits remaining. Squeeze and pinch with your fingertips to bring all the dough together, sprinkling dry bits with more small drops of the ice water mixture, if necessary, to combine. Shape the dough into a flat disc, wrap in plastic and refrigerate for at least 1 hour, preferably overnight, to give the crust time to mellow. For the double-crust dough, divide the dough in half before shaping each portion into flat discs. Juice the orange into a large bowl. Prepare the apples using an apple-peeling machine, or core, peel and thinly slice them with a sharp knife or on a mandoline. Dredge the apple slices in the orange juice. Sprinkle lightly with 2 tablespoons of the granulated sugar. Set aside to soften slightly and release some of the juices, 20 to 30 minutes. In the bowl of a food processor fitted with the blade attachment, combine the remaining 1/4 cup granulated sugar, brown sugar, chopped beet, ginger, cardamom, salt, flour, vanilla paste, zest, vinegar and bitters, and process until the beet is fully incorporated into the sugar. Drain any excess liquid from the sliced apples, add the beet-sugar mixture and toss the apples to coat them thoroughly. Tightly layer the apples in the prepared pie shell so that there are minimal gaps, mounding the apples slightly higher in the center. Arrange the lattice or pastry round on top and crimp as desired. Chill the pie in the refrigerator for 10 to 15 minutes to set the pastry. Meanwhile, position the oven racks in the bottom and center positions, place a rimmed baking sheet on the bottom rack and preheat the oven to 400 degrees F.
Brush the pastry with the egg wash to coat; if your pie has a lattice top, be careful not to drag the filling onto the pastry (it will burn). Sprinkle with the desired amount of demerara sugar. Place the pie on a rimmed baking sheet on the lowest rack of the oven. Bake for 20 to 25 minutes, or until the pastry is set and beginning to brown. Lower the oven temperature to 375 degrees F, move the pie to the center oven rack, and continue to bake until the pastry is a deep golden brown and the juices are bubbling throughout, 40 to 50 minutes longer. Recipe from The Four and Twenty Blackbirds Pie Book by Emily Elsen and Melissa Elsen. Copyright ©2013 by Emily Elsen and Melissa Elsen. Used with permission by Grand Central Publishing. All rights reserved. 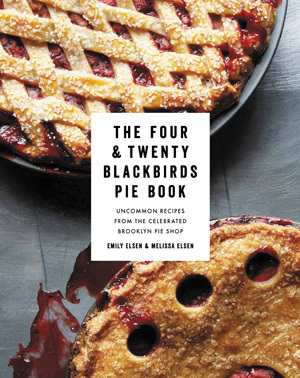 It’s been noted that The Four & Twenty Blackbirds Pie Book, by Emily Elsen and Melissa Elsen, may not be your mother’s pie book. But don’t think that the pies aren’t tried-and-true and delicious. Sisters Emily and Melissa are also the proprietors of the Four & Twenty Blackbirds café. Both grew up watching their grandmother make pies for the family restaurant in South Dakota. 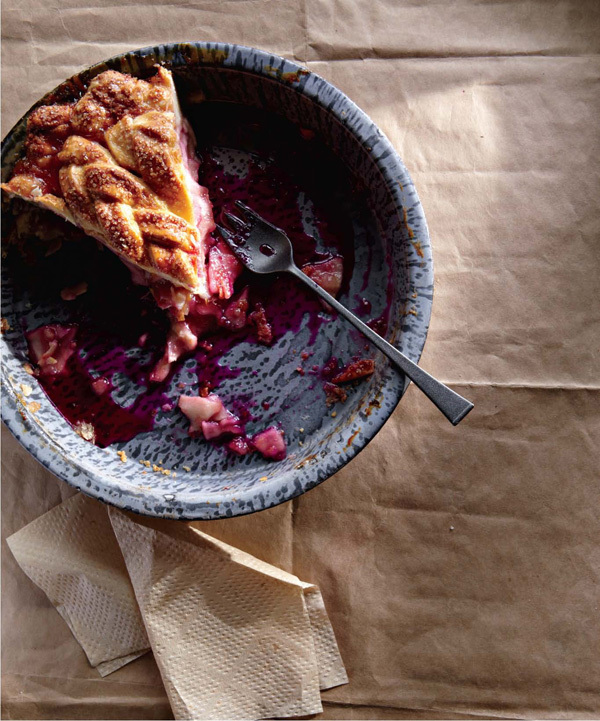 This book offers 60 unique pies (the sisters’ signature pie, salted caramel apple, was recently named one of the best pies in America by Travel & Leisure), including crusts that are traditional as well as more innovative creations. You’ll find recipes for pies like sour cherry, lemon verbena raspberry galette, skillet stone fruit streusel, Concord grape, honeyed fig crumble and green chili chocolate. Each pie is included in the appropriate seasonal section of the book, so you’ll be able to make delicious treats all year long. Whether you’ve never attempted a homemade pie, or you’ve made more than you can imagine, this book is easy to read with simple instructions. It also provides background on ingredients, how to source ingredients, pie-baking tools and, finally, techniques from making and fitting the dough to creating lattices to specific baking instructions. Did I mention the gorgeous photos? You’ll find amazing images of colorful and crusted creations for all seasons. Emily and Melissa have experimented with ingredients and flavor combinations to deliver a cookbook that will help you bake their imaginative recipes, just in case you can’t make it to their café. Melissa and Emily Elsen are sisters who were raised in the rural town of Hecla, South Dakota. Their mother and her sisters owned and operated the popular local restaurant, the Calico Kitchen, for which their grandmother Liz made all the pies. New York Magazine says they “have serious pie-making cred having grown up at the dough rolling elbow of their grandma Liz.” After pursuing different careers — Melissa in finance and Emily in sculpture and photography — they established their business in Brooklyn. They originally custom-baked pies in their apartment before opening Four & Twenty Blackbirds pie and coffee shop in 2010. Named “Artisan of the Year” by Time Out New York in 2011, they have received critical praise for the pies and have been featured in a variety of food media including the Food Network and the Cooking Channel, in the New York Times, Martha Stewart Living, and more. Visit their website at www.birdsblack.com.